We have thousands of properties for sale all over France. But we've no property for sale in Reims at the moment. And that's something we want to change. If you have a property to sell in Reims (or nearby) then act now to get a 50% discount. Just place your advert in the normal way (Click here to place your advert). Then send us an email quoting "Reims" and telling us that you you saw this offer. Reims's historical importance to France is well documented. It is the city where, in the French equivalent to Westminster Abbey, the Cathedral of Notre-Dame, the kings of France were anointed and crowned. This beautiful Gothic cathedral, along with two other monuments in the city (the Palais du Tau and the Abbey of Saint Remi) has been placed by UNESCO on the world heritage list. In celebration of this royal connection, there is a statue of Louis XV in the Place Royale, and the city also commemorates its links with Joan of Arc with an equestrian statue of the Maid in the Place Cardinal-Lucon. The Place de Drouet d'Erlon, in the centre of the city, is the place to go if you enjoy sitting in a bar or restaurant and watching city life buzz around you. There is a huge choice of eateries here and you can find menus to suit all pockets. There are many students in Reims, and they impart a vibrant modern ambience to this ancient city. The central square itself is a very attractive place to be, with its complement of lovely statues and fountains. As you would expect of a large important city in France, there is much here to delight and inform those whose interests extend to history and culture. UNESCO has listed the three monuments mentioned above, and as well as these there are many museums and art galleries to visit. It is also possible to see some interesting Roman remains in the city, including the remains of a triumphal arch thought to have been the gateway of a temple to Mars. As Reims is famous for being the champagne capital of France, it is a fascinating place for lovers of the king of wines. Most of the major champagne producers have headquarters here in the city, and it is possible to make arrangements to visit the cellars and caves under the city where the champagne is matured in chalk. 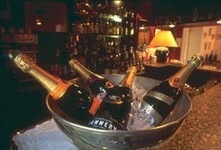 Champagne tours and tastings are a very enjoyable part of life in Reims! Reims is easily accessed from the UK. It is only around 30 minutes drive from Paris, and you can fly to Paris from many airports around the UK. Airlines flying into Paris include easyJet, Air France, British Airways, flybe, bmi, bmibaby and Ryanair. Eurostar will take you from London to Paris, and from there you can catch a TGV train to Reims. Travel by ferry is also straightforward as Reims lies south of the port of Calais off the A26 motorway. There is a massive variety of type and size of property in and around Reims, as you would expect from such a major city. A careful search should yield something to suit most property seekers. Property in the surrounding countryside of the Champagne- Ardenne tends to be quite reasonably priced, although prices will rise steeply as you travel nearer to Paris. The introduction of the TGV service in 2007 is likely to cause property values in Reims to rise, so it would be wise to take advantage of lower prices prior to this. Do you know Reims better than we do? Do you have photos of Reims? Reims is found in north-east France. It lies in the very north of the department of Marne, close to Marne's borders with the departments of Ardennes and Aisne. Access: By air: Fly to Paris from many UK airports.By rail: Eurostar to Paris, train to Reims.By road: A26 autoroute to exit 16.By ferry: Dover to Calais. Economy: Reims has a thriving and varied economy as it occupies a strategic position in Europe being situated between London and Milan and close to Paris. 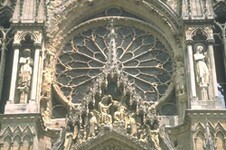 Reims is the centre of champagne production, and this also generates tourism and business tourism. Interesting fact: Champagne is aged in the chalk mines under the centre of the city. These were originally excavated by the Romans.